I am looking for a Consultant Paediatrician/Neonatologist to work on one of the most spectacular, affluent and safest islands in the Carribean. Living up to it's name in every sense, Grand Cayman fuses arts with culture, and nature with wonder, to produce the perfect atmosphere. Truly a tropical paradise, the Cayman Islands are alive with vibrant coral reefs, marine life, flora and exotic birds. This natural beauty is accompanied by one of the highest standards of living in the Caribbean, along with a sophisticated international culture, and the benefits of a flourishing financial industry. Part of an underwater mountain range running between Cuba and Belize, the Cayman Islands lie 480 miles south of Miami, 150 miles south of Cuba and 189 miles north-west of Jamaica. With an average year-round temperature range of about 75° F in winter to about 85° F in the summer, the Islands boast some of the finest tropical weather in the world. When you’re looking to get off the beach, get lost in the luxury of George Town, where colourful traditional Caribbean-style buildings meet high finance corporations, and finish the day off with a sunset cocktail. 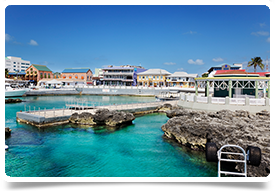 It is on Grand Cayman that you will find some of the most popular Caribbean activities, attractions, and festivals, including the popular Pirates Week and the colourful and exciting Batabano (the Grand Cayman Carnival). Other popular attractions include the Cayman Islands National Museum, Rum Point, Pedro St. James, Bodden Town, the first capital of the Cayman Islands, Cayman Turtle Farm, and the National’s Trusts Mastic Trail, a 2-mile traditional footpath through unspoiled woodlands.